Lost decade in Irish non-residential property? 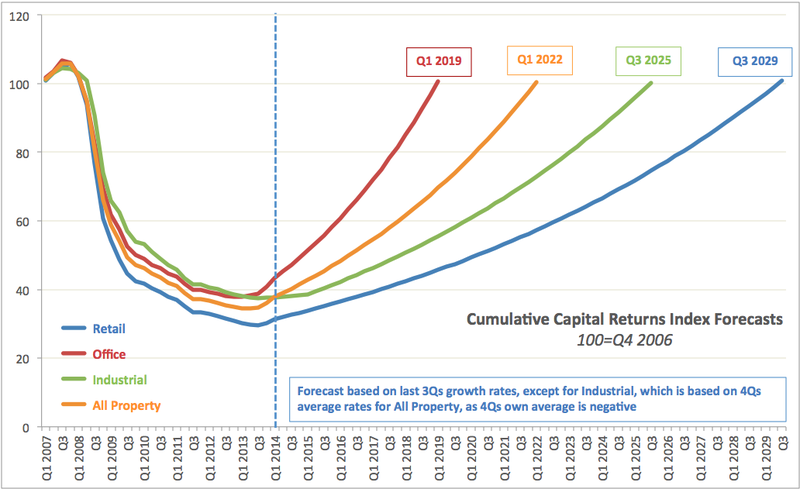 Based on IPD quarterly index, here is an exercise in basic forecasting (take it as just a stab in the dark - things can go all over the shop in a small economy, like Ireland) for capital values returns for 4 asset classes of Irish non-residential property. Last 4 quarters growth rate of 2.3% for All Property taken as growth rate for Industrial class (own Industrial Class 3 quarters growth rate is 0% and own 4 quarters growth rate is negative - 0.2%). Finally, in one segment - Offices - we do have some rays of hope - both uplift and dynamics of that uplift are supportive of the stronger case than what I expected back in the days of 2010, when Nama was unloading properties off the banks balancesheets. This is the totally wrong way to look at it. Non-Residential property in Ireland, or anywhere else, should not be viewed from a point of view of capital returns, even using Q4 2006 as the base. You look at what that non-residential property 'capital', was made up of, . . and it was mainly made up of land price. Forget the construction of whatever, Grade A office space, Tier One Industrial space, Prime retail space. That is just the thin end of the wedge in all of this. And as a small economy in Ireland even, we do have to be able to accurately assess and schedule the construction of adequate supply of space, that the market will consume. But you read the Irish Independent toady for instance, and the property professionals in Ireland, seem to make a division between 'city centre' Dublin non-residential and office space, and suburban. And the Irish independent does report today, on the broadening of the gap between the city centre and suburban office space in Dublin city. To be honest, this is a joke. What we have in Dublin city at the moment, is a registered voter population of over 300,000 in the Dublin City Council region. We have underneath 200,000 population in the remaining three Dublin local authority regions. What we should be doing, is developing the three other Dublin local authority regions, up to a population density something like that in Dublin City Council's region. That would be roughly equivalent to the model that is used in London city for example, where they have as many as 32 different borough local authority regions, each one of which has its own critical mass of population and each one is no larger than the area of land that Dublin City Council controls (some of them much smaller, with much higher population densities). So this distinction in the office space market, that the Irish property professionals draw between Dublin city centre and what it calls 'suburban' Dublin, . . . is really a distinction that we have to thrown in the bin, very fast indeed. Because it doesn't make any sense from a long term sustainable urban growth and development point of view. We need to see Dublin as a poly-centric city for the 21st century, rather than as a uni-centric city, like it is viewed at, at present, from a point of view of non-residential property space. Now, that base 100 of Q4 2006, that you mentioned in the forcast, was for a time in Dublin city, were commercial development land was trading at values, a whole ten times greater than it trades for it at the moment. The problem in Ireland is, we don't actually have a market for trading of non-residential property space, . . . all we have going on is a game of buying and selling the land associated with the development of those assets, by banks and financial institutions, . . . and not that much real production of the space in question, going on. The use of the base 100 of Q4 2006, doesn't really make that much sense therefore. We don't really want to regain the capital values of Q4 2006,... or if we do, then we are probably back into a situation again, whereby we are just trading the development land to build commercial space, but not building any commercial space. You get to development land values of ten times what it trades at, at the moment, . . . . and what tends to happen, is people treat it like gold. I.e. The development land, no longer is an input of production,... it just becomes too expensive to develop or build on it. The only thing that you can do with development land, at the price levels it was trading at in Q4 2006, is look at it and admire it. What your forecast is suggesting therefore, is that we need to return to that. Literally, all that will happen, if we do see the capital return, as is suggested in the forecast graph happen,.... is that, a whole load of lending will happen again, in the commercial development land market in Dublin city,... and that money will just 'sit there', as it did from 2006 on wards in Dublin, and roll up interest. Nothing will get built. Financial institutions will get into trouble again. And another whole decade will be consumed in Ireland, doing exactly what NAMA professionals are employed two billion euros to do today, which to to move figures around on spreadsheets, and very little else. What we have had in Ireland since the early 2000's, in the Dublin market in particular, is a greater and greater about of so-called 'builders', who do nothing more than shift paper work around the place. There is no actual delivery of product to the 'market'. In other words, in the Dublin market for non-residential,... as the shortage of supply on non-residential space gets worse in Dublin, the speculation in land on which to construct that sort of space, increases. And then as the price of such land increases, speculation in that asset increases. Until we ultimately end up with a community of highly publicized 'paper builders', who start to appear in national newspapers, pouring campaign and visiting race courses,... and not much else in the way of production of anything. A better way to think about capital returns in non-residential property space, is as follows. Now, just to take that blue line on the graph - the retail space line - which is actually the longest 'lost decade' of an entire twenty years in length. There is a very good reason for that. I was trying to explain to someone earlier today, the idea of a Real Estate Investment Trust, in the market for property, construction and development. I mean, the question is, why do we even have REIT's? Mainly, the point is, where you don't have REIT's, a lot of 'stuff' just sits on balance sheets of banks, companies and local, or national government balance sheets. I mean, at the moment, the coalition government in Ireland is anxious to create affordable residential space for its citizens, but without having that appear on the balance sheet of the Irish state. The three examples of where REIT type vehicles might be employed, in order to keep things off of the balance sheets of banks, companies, states or local authorities,... but at the same time, these assets do need to be financed in some way,... over the longer term. Think of things like airports, think of things like shopping centres, or think of something like motorways. The common factor in all of these things is capacity. Whenever we think about REIT's, we should always think in terms of capacity, or rather under-used, or capacity, of something, which you do not have an immediate demand for. Economists would look at this, and ask, why would you produce something, where there is no immediate demand. For example, you see things like Timber REIT's, in the United States. You have forests that might be used as recreation facilities for decades, for hunting and camping. But these are assets, which are set up to be employed as needed for building materials, when the need arises. You need some way to hold these things, and finance them (preferably off balance sheet of various entities), which will ensure that it is there,... when it is really needed. So Timber REIT's are an excellent example. Now, getting back to the examples - the shopping centre, the motorway or the airport. This is the kind of thing that is useful to look at, from a point of view of understanding of capital return in non-residential space. The common factor here again is capacity, or rather under-used capacity. It is like the 'dark fiber' in the telecommunications industry. The infrastructure which isn't used. And what typically happens, is that when companies with a certain debt-type capital structure get into these areas, and speculate, they go bust in spectacular fashion. They get a severe helping of the 'wooden spoon'. But that is not to say, that it doesn't make sense to over-produce in some areas of the economy, and use some means to finance that over-production, where you do generate a capital return over the longer term,.... like the twenty year long, lost decade as in retail. The thing is, we have a history and legacy of civil engineering projects, where at a given time we make a decision to build only two lanes, instead of three lanes. We need two lanes maximum at point in time A), and we discover only twenty years later at point in time B), that we haven't enough. We see it in planning and development on airport sites too. The numbers, the raw data of traffic of human beings through Dublin airport in the 2000's (because we have a very small open economy, that when activity increases, a lot of labour moves in and out of the country), suggested the ramp up in capacity needed on the site of Dublin airport. What happens, is you build space to accommodate traffic at a given level, and in twenty years time, the public wants to know, what we didn't provide enough capacity at Dublin airport, when we were building in the first place (that's generally what happens in ring road motorways). So when we need the capacity, we haven't got it, and it can't be delivered in anything like the right amount of time to market,... given the difficulty and risks of building anything on airport campuses, at any time. But when you produce the capacity, that might be needed in advance,... it becomes a huge political hot potato. No one wants to be associated with the idea of producing an over capacity,... which might take some years to reach return on capital first employed. But the idea I am getting at, is that in infrastructure, we often need to deliver capacity at one time, which will exceed a demand. Remember that REIT's appeared first of all, in the area of utilities in the United States. Electricity is a perfect example of the same. In Ireland for example, Ardnacrusha hydro power station in Tipperary supplied 100% nearly of all power consumption needs in the Irish state. Nowadays, it produces three percent at best. When we think about capital returns, and 'lost decades', in non-residential property,... including retail space,... we need to think in terms of these problems in many industries of delivery of capacity to accommodate demands at different times. I just want to quickly relate this all back to retail space, the twenty year 'lost decade', as briefly as I am able. What we tend to find in retail space, is the delivery of capacity that is delivered at least twenty years in advance of when it will be required. We could certainly argue that this should not happen. But very often, we do see the building of, or the beginnings of buildings of shopping centres on sites, at times long before the demand and community exists around those sites. You look at any of the successful retail sites anywhere in Ireland today, and you will see this. But of course, in this area too, like in motorways or in airports,... what you tend to see at the moment is a very easy target in retail space,... like why did we 'over produce'. It is like that motorway ring road which included one extra lane, or the airport terminal that had a little too much baggage handling,... or fiber optic infrastructure, that was dark for a while. There are financial charges attached with doing this no doubt, but that doesn't necessarily mean, we shouldn't do it at all. It is like how they grow those forests in the United States, which the Timber REIT's own. The thing not to do, is to have a shortage of forestry land, at times where the economy is growing, and you do need to build. Because then, you need up building a lot at one time, over paying for it, owing to a lack of supply of materials. And you still have to finance that legacy debt. In some ways, it makes a little more sense to finance the growing of the timber in advance, rather than paying for the debt of the over-priced timber, afterwards. But people from the economics background who look at 'efficiency' tend to dislike the former, and perhaps prefer the latter,... because they love fiddling around with things like balance sheets, which contain lots of debt,... and do not like forests and forestry asset management as much (it's not their core competency). You produce grade 'A' prime retail space, you deliver that capacity to the market, using the right design, the right construction,... and you deliver that under the usual capital structure that applies to private enterprise and companies,... and you are almost guaranteed to go out of business. But what we also tend to find with these facilities, is that over time that the production of such grade 'A' retail space, does eventually generate a return. It was interesting to read in today's Irish Independent newspaper,... that the vacancy level of 14% of all office space in Dublin city, has changed in its make up. There used to be over 20% vacancy in the 'grade A' office space in Dublin city, and that has reduced down to nearly 10% now (and is only four percent in Dublin city centre). But what has also happened, is that grade 'C' office space vacancy rates have increased from 40% to nearly 50% during the space recent period. What conventional economic efficiency theory would tend to suggest, is that we produce office space in a short lead-in time. We do it very rushed, we just use whatever bits of land and planning consents are available on short notice. We do that, and we tend to produce a lot of the grade 'C' type of space. The grade 'A' type of office space, requires more planning, and you need to produce a lot more of it, in advance of demand,... and with all of the toxic financing problems associated with that more ambitious program,... and eventually a capital return is guaranteed, on that grade 'A' space. This is the way in which REIT's tend to operate, when they do operate in property at all (be it residential or non-residential). What you will always hear from the likes of Hines international property, for example, is it is about producing high quality space,... and not so much about using things like 'internal rates of return', on investment. But think of capital return in non-residential problem, in a similar way to how one should think about REIT's, when applied to any kind of longer term infrastructure or asset. Another example of the same phenomenon that cropped up in a story even today, on RTE's radio show in the evenings, DriveTime, was this thing of building very good, fit-for-purpose, hospital space. The medical practitioner and hospital chief executive interviewed on Irish radio, admitted that their facilities and buildings had improved a lot. But the problem was, in the smaller hospitals at least, that as these nice new building projects got delivered, . . . they started losing the staff, with which to operate in those facilities. The hospital chief executive interviewed on radio, mentioned that under a previous plan for the Limerick region, that 200 bed spaces were promised adjacent to Limerick hospital. They were intended to become private bed spaces. In any event, the plan was scrapped, and somehow or other the need for those additional 200 bed spaces at the site at Limerick was missed in all of it. The idea of removing staff away from the smaller hospitals, was to lead to more patients being sent to the one central hospital. Ironically now, the smaller hospital (which has less personnel than it used to), has new buildings and un-used capacity in terms of bed spaces. Whereas the larger central hospital, has more patients but it short of these promised 200 additional bed spaces, on its site. The healthcare industry again, is an excellent example of this thing with construction, where we do sometimes need to produce capacity, in advance of demand. The hospital chief executive interviewed hoped that maybe in the future, the staffing levels at her smaller hospital would return back to the levels that she used to have, and that her 'spare' capacity that is available, and is high standard, will get used. This is a planning and policy decision. But the point is, that one way or another, the capacity needed to upgrade that smaller hospital site, was delivered. Between the confusion of starting and stopping various other projects at the much larger site, the larger hospital ironically ended up without the capacity that it now needs. It ends up on the front page head lines therefore, and becomes a political issue of the week. What you will notice too, very much, if you look at the American non-residential real estate industry, . . . is a lot of the top Real Estate Investment Trusts, are actually healthcare REIT's that began a few decades ago (often with quite humble beginnings), but since then have grown considerably in size, strength and influence. I would relate it back to this idea that I previously mentioned, of the efficiency in construction projects, is more often purchased by producing space in advance of demand. And it is getting back to that thing that I mentioned about keeping stuff off the balance sheet of the public sector, or even the private sector, risk taking banking institutions and development companies. That is an unfortunate aspect to construction as an industry, and it causes no end of problems. Not least, because companies who are set up to build and develop sites, set out to do so using capital structures (heavily debt laden), in their firms, which are ill-equipped to deal with this way of production that I mention. I keep getting back to that example of where REIT's first came from. Things such as forestry management, utility and services capacity production, created at times in advance of when demand for it existed. What tends to happen over time, with a shopping centre site, or a hydro electric project, is that over time, what may have offered 100% of capacity needed for the local community, . . . in time it gets 'swallowed up', and eventually only accounts for a small percentage of capacity. In effect, these facilities become a legacy, of the past, . . . and the main task is in finding a way to remove them from the whole system, without causing too many problems in the process. Whenever we are talking about capital investment, capital spending, delivery of critical infrastructure, we always run into the same problems to do with financial structures that don't work, or aren't suited to the task at hand. It ends up becoming really expensive afterwards when these things collapse, and often things like the credit system itself collapses at the same time. REIT's were a kind of north American invention (where they faced much, much larger challenges in terms of delivering capacity in so many areas of normal life, and providing infrastructure, than we do here in Ireland). REIT's were a kind of way, as I said, to grow the timber in advance of actual need, and find some way to finance that and manage it over a longer term period,. . . instead of dealing with the problems of acute shortages of material at times of maximum demand, . . and the associated debt burden that comes out of paying for a material such as timber, which could become really over-priced, really quickly. You look around you, at all the major capital intensive departments in the Irish state, and you will see this problem coming up, over and over again. And it's exactly the same, in many parts of the developing world. Exactly the same. Make no mistake about it, and you only have to look at the north American economy to see it, where they have very high levels of demand in aggregate for all kinds of capital spending and types of services, that demand on physical infrastructure, . . . you can't just show up to the party, . . . without the right costume, as far as physical construction is concerned. What I mean by 'costume', is the capital structure that you choose with which to operate in construction. Construction of anything physical, at the scale of infrastructure and non-residential space, . . . is very intensive in equity. This is what the huge rise of REIT type of portfolios in north America is all about. It is a way to do construction, without depending too heavily on debt forms of capital. What we did in Ireland, at the same time as we built so much of our economic well being, around construction, as an activity, . . . was that we financed ourselves with an awful lot of new forms of debt, at precisely the wrong time. I am absolutely sure, that at various times, and for various applications, credit and leverage is exactly the right policy. But there are other applications, and other times, when too much debt of any kind, is exactly the worst decision you could make, as an economy. In terms of the banking inquiry, and looking at where it all went wrong in Ireland, we should consider this. We have a state which is reluctant to carry too much, on its balance sheet. We, as a small nation, will never have an awful lot of equity, on hand to use for anything. And the temptation is always going to be there, in times of high growth in the Irish economy, to reach for access to the debt markets for capital, when we really need to consume capital. This is something that we really do need to think about. Because, what I tried to explain above, in terms of delivering the sort of excess capacity, in advance, that is often demanded for infrastructure creation, . . . debt finance, combined with infrastructure spending, can be a lethal concoction. There aren't a lot of other options, but there are some, and we should examine those other options as carefully as possible.